At one point, James Syhabout, the chef behind Commis in Oakland, wasn’t proud of his Lao heritage or the food central to it. But now, after finding his way through coming up in his mother’s kitchen and fine-dining restaurants around the world, he’s more than proud. And he’s urging readers to learn, eat and cook the food of his homeland through his new cookbook, Hawker Fare. “It’s just easier to say you’re Thai,” writes James Syhabout, the chef behind fine-dining-focused Commis in Oakland and Best New Chef back in 2010, in his years-in-the-making cookbook, Hawker Fare. Just like it’s easier to say your name is James instead of the one you’re born with—Somchith. Or to keep quiet about your weekend plans when kids at school talk about their birthday parties while you spent the better part of it prepping chiles and garlic at Wat Phou, a Thai restaurant run by your parents and uncles in Concord, California. The food of Laos can be elusive. Not many Thai restaurants show off their Lao offerings, but they’re ever present on the menus—cooling papaya salad, textural larb (flavorful minced meat salads), smoky gai yang (grilled chicken)—and ever satisfying. Which is how they became mainstays in Bangkok back in the late 1800s, when Lao natives flocked to the city in search of blue-collar jobs and cooked the food of their homeland. When tourists stumbled upon these street foods, it was just lumped in with the Thai cooking canon because they didn’t know any better. It’s just easier. And these dishes eventually made their way to the States through families like the Syhabouts. It’s a reality he knows all too well as a kid growing up in Oakland’s “Laotian ghetto.” His mom would make khao pad (fried rice) with Uncle Ben’s mix and Spam. But it’s also a reality that he’s redeemed, in a way, by focusing on the food of his childhood through opening Hawker Fare in San Francisco and Hawking Bird in Oakland. He goes to the same produce markets his mom frequented for the restaurant, only now he buys from the kids he played with growing up. 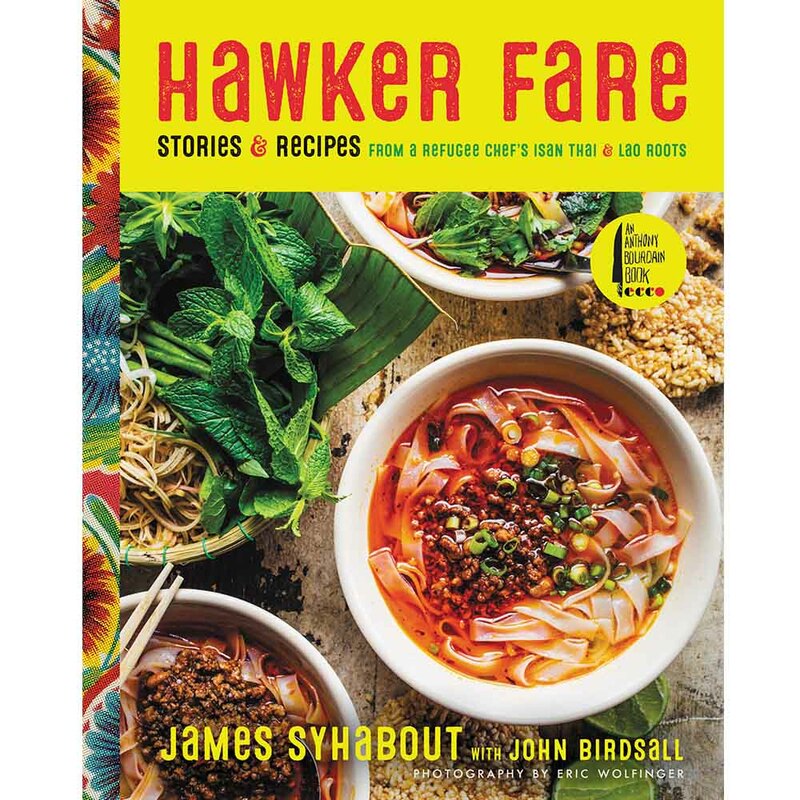 In Hawker Fare—this part cookbook, part memoir, written with journalist John Birdsall and shot by photographer Eric Wolfinger—Syhabout lets the reader respond to that ebb and flow of the recipes. He exhorts you to season to taste throughout cooking, to start with less chiles at first and to garnish pho lao with shrimp paste, a pinch of sugar, Thai basil, mung bean sprouts, a squeeze of lime, hell, even Sriracha, depending on how you might feel that day. I did just that on a cold, wintry day this past month, after waiting for a few hours for this brisket and beef neck bones soup to come together. 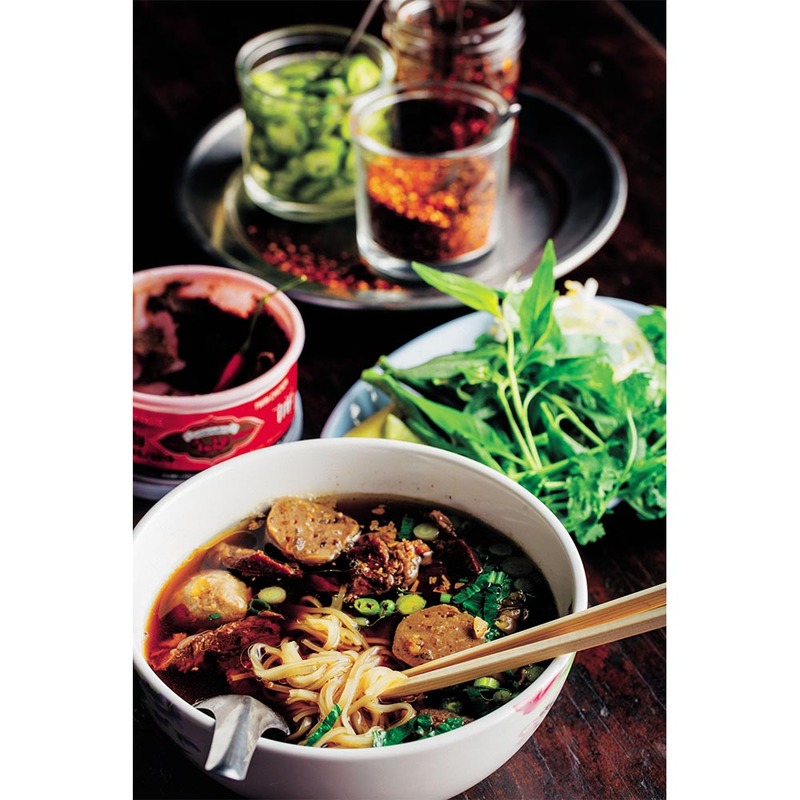 Pho lao is the result of the Vietnamese influence on Lao food, Syhabout writes. And I made the most of what I had going for me: I took leftover beef balls from hot pot the night before and subbed the fried garlic oil for Jacobsen’s garlic salt. Once the meaty flesh fell off the bones and the kitchen smelled star anise-y and soothing, I took all those hot pot scraps, well-loved condiments, new pantry friends (hello, fish paste! ), herbs and a good heap of rice noodles to fix up my bowl of pho lao. It was like nothing I’ve tasted before, at once super fresh and bright but with fishy, meaty depth that grounded it. I ate it too quickly to take a good photo of it, but my husband got one of me looking very greedy around my bowl. “My larger goal for this book is to build an audience for Lao and Isan food,” says Syhabout. It’s working—one beefy noodle soup convert at a time.